The 1934 Cardinals will forever be remembered as the legendary Gashouse Gang. Without the luxury of having extra uniforms or the ability to wash them after each game, the fun loving Redbirds arrived in New York to play the Giants after a rain soaked game in Boston, inspiring one New York sportswriter to note that they looked like "the gang from around the gashouse." (a rough neighborhood in the lower East Side that once had housed several large gas tanks). "Rookie" manager Frank Frisch tried to introduce some discipline during spring training: no drinking, no gambling, and midnight curfew on road trips.... but few players could follow them. 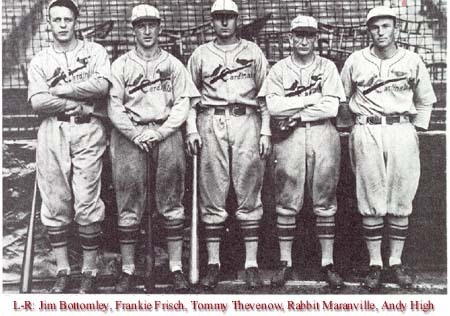 The 1934 Cardinals weren't the most athletically talented, but the hard playing, cussing, fighting Gashouse Gang captured the imagination of baseball fans everywhere, who loved the team's style: rough, rowdy, and ready. As Dizzy Dean said, "Them fellas ate it up!"